A radical and brilliant departure for Margaret Atwood, this story is told with such power that the reader will be unable to forget its images and its forecast. Set in the near future, it describes life in what was once the United States, now called the Republic of Gilead, a monotheocracy that has reacted to social unrest by reverting to a society of repressive intolerance. THE HANDMAID’S TALE is a frightening look at a not too distant future where sterility is the norm, and fertile woman are treated as cattle, to produce children for the upper class who cannot have any. 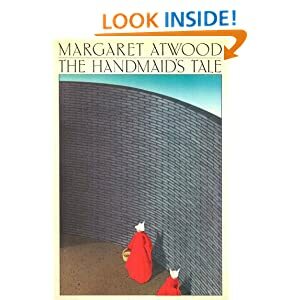 The narrator Offred, as she is called in her new life, is the Handmaid for a top Commander in the new government. Once a month she is tested by a gynecologist to ensure that she is healthy, and then is taken to the Commander and his wife in the hopes of becoming pregnant. Offred, along with the other handmaid’s, are not allowed to look directly at anyone else. They all wear the same outfits; red long dresses and headgear that cover their bodies. They live together, spend most of their time together, and are taken care of, in the hopes that they will produce children for this barren society. In this society, most women are not allowed to read, and are treated as if they have no minds. The government dictates their role in society. If they disobey, they are punished severely. Offred’s memories often go back to a time when she was happily married to Luke, and with their daughter they were looking forward to a long and happy life together. Things changed when a military group took over the government, and immediately their lives as they knew it were over. Women lost all rights to ownership; bank accounts were frozen, land was taken away; fertile women were taken away from their husbands and families. A handful of older women were made into `Aunts’, and their duties were to instruct and guide the handmaids, reminding them of their role on this earth, which is to procreate. I have to say that my feelings during this book were of shock. In some sense, what has happened in this book has already happened in other parts of the world and can happen again. The control over women is very much like that of the women in Afghanistan. The control over religious choice brings to mind Nazi Germany, as one of the issues in the Handmaid’s Tale is the elimination of anyone that refuses to be as one with the new government – religious persecution is justified and encouraged. Hot Donut is a game for your Kindle. Today you can get it for free. But only today. How hot are you, little donut? Are you sizzling hot, just warmish, or downright soggy? 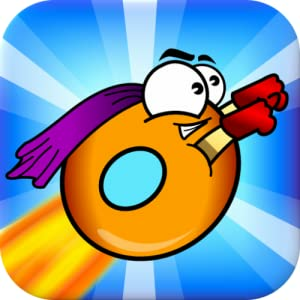 Find out when you roll, jump, and dash your way through four awe-inspiring worlds in the fun Android game, Hot Donut. This pastry-turned-action-hero obviously means business. He’s dressed for success in his purple cape, red gloves, and Superman stance. He also has large eyes meant for spying … fireflies, which, if you’re lucky enough to catch, give you extra points. The fun begins in an idyllic mountain scene with plenty of hills and valleys to traverse, chasms to jump, clear skies to fly through, and shimmering fireflies to catch. Simple one-touch controls are easy to learn. Just touch anywhere on the screen to increase gravity and roll down hills; let go at the top of a hill to fly. Touch two thumbs to dash and float over those big gaps. Great for kids, the app also provides written hints as you play, which will save you from getting fried or otherwise spinning to your death. You can also earn free power-ups that allow you to dash upward, float in mid-air, or get a spontaneous boost of speed. Gather gifts too and enjoy upbeat music as you play. See how many dozens of levels you can polish off and watch as your score heats up.